Gems for the Journey, Issue #005 -- Are you finding hope? Here in the northern hemisphere, we are experiencing spring. Spring is typically as season where we talk about hope and new life. 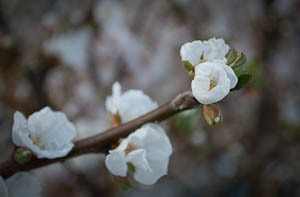 Depending on your current life experience, you may or may not feel able to connect with the hopefulness of spring. In my book, Seasons of Solace, I include photos from nature that helped me connect with my emotional state of being. During my grief journey, I would (and still do) take my camera with me on a walk. When an image drew my attention, I would stop. Sometimes I would take a couple of photos and keep walking. Other times I would stay there with the image and try to see what the image was stirring in my emotions. 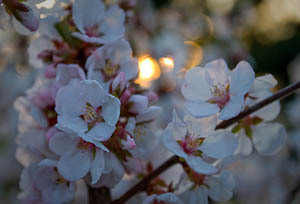 Last spring, I watched a cherry tree in the back yard. 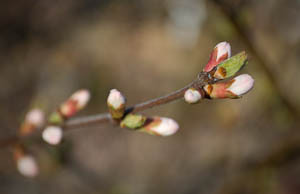 I noticed how tight the buds where when they were in early formation. I noticed places where I felt bound up and tight--places of anxiety, places where I felt no hope. 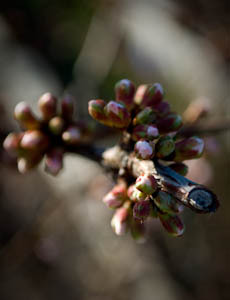 After I took this photo, I was struck by the hope I saw in the presence of the sunlight on the buds. So I pondered the unexpected rays of light that I found within me--in spite of tightness and anxiety? In this photo I just couldn't take my attention away from that cut end. The pruning in life feels so painful. I grieve the losses of things and people who have been cut off from my life. Yet, here is new life coming forth on this very branch. How can this be? 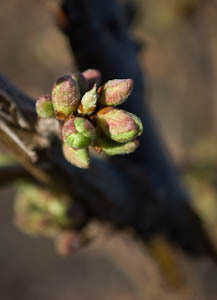 Where do I see cut off stems bringing forth new buds in my life? Some days hope feels dark and dim in spite of new growth. Five minutes a day with some flowers taught me that I was not alone in my struggle to find hope. And then all my little lessons in hope fluttered to the ground spreading a table cloth for a feast of cherries to come. I wish you glimpses of hope in the light of spring. Mary J Luquette is a friend of mine who quilted her way through complicated grief. Photos of her award-winning quilts are included with her story. Paul Stutzman author of Hiking Through decided to hike the Appalachian Trail as a way to deal with his grief after his wife died of cancer. Inspirational prayers and prayer requests is a place to find prayers that may be helpful to your healing journey. You can also make prayer requests and offer prayers for others. Why Learn to Write Poetry is an article that may inspire you to try your hand at poetry if you haven't done so before. Also in the next day or two there should be an article of ideas to help you get started writing poetry. Creative Writing Prompts provides some ideas for those days when you feel like you want or need to write, but just don't know where to begin. Recently I began doing poetry readings from Seasons of Solace at local retirement homes. At first I wasn't sure if a more mature generation would relate to the rants of a young widow. I was surprised as person after person came up and thanked me for being so real with my feelings. They then shared with me their own stories of loss. I was struck again by the fact that although our grief is all individual, there is commonality on this unfortunate road we travel. The next poetry reading/book signing will be at Garden Spot Village on Monday, April 19 at 7 pm. You can read more details here. If you are local to Pennsylvania, you may be interested in a series of retreats that Mary J Luquette and I are offering. This retreat provides space for participants to explore their spiritual journey through scrapbooking, photography, and other visual arts. No art experience is necessary, just a desire to enrich your prayer life and connect with God in new ways around your life story. Both Mary and I found the artistic expression of life journey to be healing as we worked through grief following the death of family members. Mary enjoys working with paper collage and fabric. I enjoy writing, scrapbooking, and photography. You can find out more info on the site by clicking here. Feel free to contact me if you think of anything that would be a helpful addition to the site. Also feel free to pass this newsletter on to anyone you might know who would find it helpful.